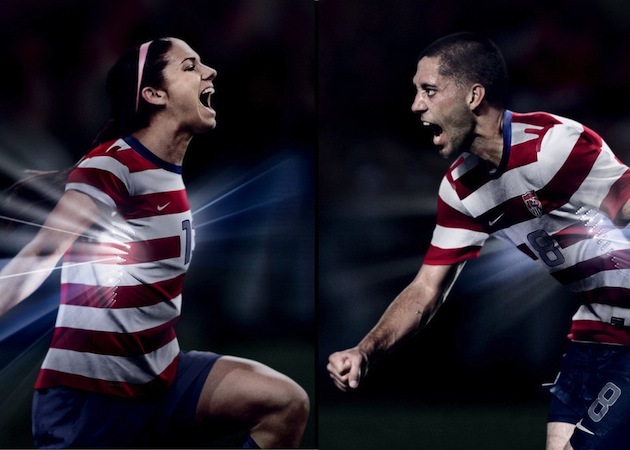 The new US National Team jerseys are not. It's one thing for Nike to completely rebrand our teams every two years. Turning them into cartoonish laughing stocks is another. I'll expand on this later, for now though consider the following. - Clint Dempsey is a badass. - He looks the part, but even he looks silly in the new home jersey. - Damn, even Alex Morgan suffers. - Look at it and weep. Maybe I'm just being a troll, but damn. To me, it's only a laughing stock because these are the latest in a long line of gimmicky shirts that rotate every 2-3 years. If these were gonna be our away jerseys for the next 20 years, I'd be thrilled. They're super unique (at int'l level), and instantly evoke our flag. I say keep this as the away forever, and cycle through as many iterations of white or navy as Nike wants for our home shirts. Beams of light coming out of the sides would be a nice touch. Wonder if we'll have a third and what direction we go if we do. All of the colors are taken.....would love to go back to the anthracite kits of a few years back. isnt this going to be our HOME jersey? the blue one is our away, no? They're interesting, but too close to a "mime outfit". I think if they were striped they should have done ala Newcastle style, or even do a very light shade like how the sash was across the front of the current jerseys. Yeah, sorry, these are the Home shirts. Don't know how I got hung up on Aways. I agree with Jon that we need a recognizable permanent kit. Barcelona, Milan, Inter, Argentina, Brazil. etc., etc - they experiment sometimes as well, but otherwise you can tell who is playing with a half a glance. @Unknown, there are already 2 international shirts that actually befit your comments. France and Paraguay. The plan was defiantly to have them match for the olympics. But I would like that same way of thinking to continue. And I like the fact that they actually resemble our national flag (however Great Britain's olympic jersey is a little to much overkill). I would like us to keep it so we actually have a signature look. I agree in that if we roll with this for a while I'd naturally warm up to it, but Nike and US Soccer have shown no such inclination. I didn't want to clog up the comments too much with an overarching response to everything that's been said, so I made a new post. @Anatoly M: Thanks for the photo link. who cares what dempsey looks like. when are we going to get this flipping dubious goals panel to meet, so we can end this freaking nonsense. Haha, I haven't forgotten about your trivia bit either if it's any comfort.